Footwear brand delighted fans with an immersive townhouse. 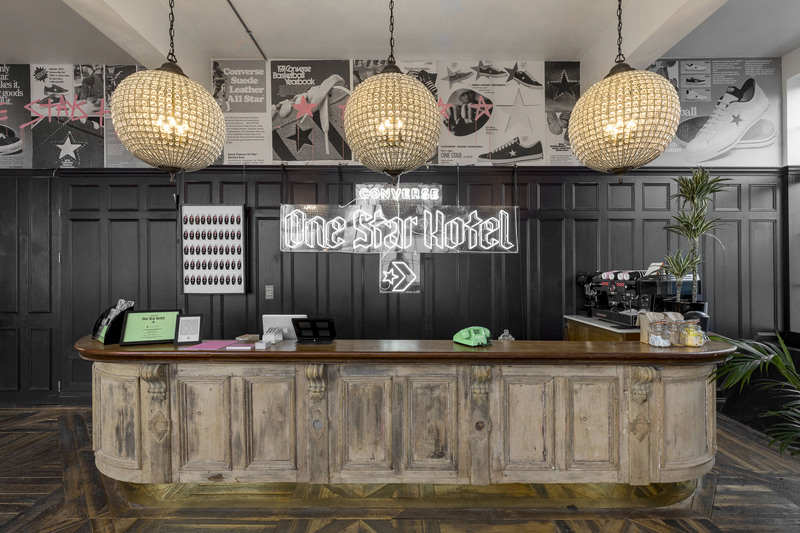 When the Converse One Star Hotel opened its doors for two days, on 16 and 17 February, in London’s Shoreditch, it welcomed crowds of culture seekers to enjoy an immersive experience designed to celebrate skate lifestyle and the 1990s nostalgia influencing today’s youth. Timed to coincide with London Fashion Week, it featured exclusive merchandise housed within a pop-up store, programming and music from the Converse Collective and a series of workshops and talks. The experience, delivered by XYZ with design provided by Hotel, justifiably bagged Creative Event of the Year at the Campaign Event Awards in a year of stiff competition. And a review of the work details exactly why this experience impressed the judges. Inside the townhouse, a range of rooms brought together the concept of “sneaker, skate, fashion and music”. Inspired by the brand’s famous footwear, each room and communal area had its own creative direction, telling authentic stories and inspiring interaction, with every touchpoint reflecting the One Star attitude. Those who wandered into the cotton candy-hued “Step into sweetness” room could view the pastel colours of the yet-to-be-released One Star Premium Suede shoes, while “Grape” featured a new film of the same name about London’s skate scene made by Jamie Platt, a 20-year-old skater from Bournemouth. With a concrete design to represent the harsh landscape of London’s skate scene, the room was designed around the One Star Pro, the brand’s “increased durability” shoe, also yet to be released. “Somewhere in mid-century” was designed by rapper A$AP Nast and featured live screen printing and a very limited first-time release of the Converse x A$AP Nast One Star corduroy shoe in the UK. Other rooms included “Mahjong”, celebrating the Chinese New Year with hip-hop artist Tizzy T and “World affairs”, with Swedish rapper Yung Lean hosting daily backgammon matches on an oversized table. Firth adds that this sentiment was reflected in the huge number of people who visited over the two days, with an average dwell time of nearly 40 minutes. A large proportion of guests returned the following day, too. The biggest challenge, Firth adds, was the “unknown” factor of doing something on this scale without a guaranteed audience. Converse only asked for RSVPs for the workshops and evening events, so it was essentially programming in the dark, and it had to bring together a complex mix of limited-edition product drops, appearances from ambassadors and activity throughout the day without the guarantee of an audience. “In the end, the openness was the best thing about the One Star Hotel – having people who would never usually get to experience these things really put them at the heart of the One Star Hotel, elevating the best of London street culture to the world,” Firth says.